How are companies using the Reporting Framework for both reporting and to galvanize improved management of human rights? This page features interviews with companies that are using the Reporting Framework both for reporting as well as for internal management. We also feature additional examples of how companies are using the Reporting Framework for internal management on our Users and Supporters page. At the bottom of this page, users can also download a January 2016 ‘lessons learned’ document from early adopter companies of the Reporting Framework. Unilever is the first adopter of the UNGP Reporting Framework and participated in the launch of the Framework in February 2015. They issued their first report using the Framework in June 2015. Unilever’s disclosure is also included in the UNGP Reporting Database. Q: Unilever started working with the Reporting Framework before it was final. Why did you decide to use the Framework, and to be the first adopter of it? A: It dates back to 2014, when we strengthened the Unilever Sustainable Living Plan. We created three new pillars, one of which was Fairness in the Workplace — all about human rights — and had the commitment to implement the UN Guiding Principles, including reporting publicly on our progress. So we had the commitment, but we were faced with the question: how do we report on this? Human rights are such a big topic. We were extremely lucky that just at the time we were wrestling with this question, the Reporting Framework was was being developed. What particularly attracted us to the Framework was that it had undergone such an extensive process of external consultation. So we knew not only was the Framework developed by real experts on the UN Guiding Principles, but also we knew that it had undergone an extensive period of external consultation. Q: Tell us about the process of preparing your Human Rights Report. What went well? What was hard? A: The internal discussions and learning were as important as the end result of the external report. Getting people from all different functions – including the most senior level of the business – in a room to talk about human rights and how to tackle endemic issues and their root causes was incredibly useful. In terms of challenges, the time taken to gather and check information for the report always takes longer than expected and we also wanted to ensure that the report was engaging for the reader. Q: What’s next for you on human rights and reporting? A: At this stage we feel we have set a good foundation on policy and embedding. Our key efforts these days are focused on the implementation – there is always more to be done in that area. One exciting change is that from the beginning of July my team moved from working up the Chief Sustainability Office to the supply chain department. We think this is going to be really helpful because here we can fully embed our human rights work by working even more closely with colleagues who implement our policies and strategy on the ground. This is where we have the potential for the greatest social impact. We are also planning to update our Human Rights Report. It’s going to be interesting how we choose to focus it. Thanks to our work on the first edition, we are clear on our salient human rights issues – we are clear on where the risks are. We’ve done a human rights impact assessment in Myanmar. We continue to do risk mapping related to our key commodities. We continue to roll out our Responsible Sourcing Policy and Responsible Business Partner Policy. Our report on human rights is a living document. As expectations and challenges develop, our work to actively manage our potential human rights impacts will evolve, as of course will our reporting. ABN AMRO issued its first report using the UNGP Reporting Framework in December 2016. Q: ABN AMRO is the first bank in the world to publicly report on their implementation of the UN Guiding Principles on Business and Human Rights, using the UNGP Reporting Framework. Why did ABN AMRO choose to do this? 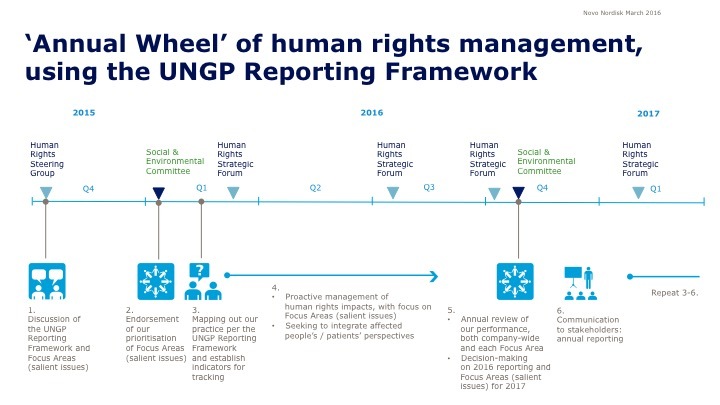 A: Our goal when committing to use the UNGP Reporting Framework was to strengthen our human rights management processes. We wanted to take a structured and systemic approach when strenghtening our processes, so we could feel confident we had considered the issues in a comprehensive way. Our bank has been active for many years on human rights issues and we’ve followed the development of the UN Guiding Principles since they were originally conceived. For the first several years of work on this topic within ABN AMRO, we focused on getting buy-in for human rights amongst our colleagues. We identified and trained certain colleagues as ambassadors, across various functions in the bank. We wanted to get people moving on this topic. Some years later, we saw that we needed to take this to the next level by having a more formalized approach that would establish a clear and comprehensive human rights management process. And that process would need to excite and invite participation from even more colleagues than before. We believed that formally committing to use the UNGP Reporting Framework would help us establish this process and build even more buy-in from colleagues and stakeholders. And that indeed has worked. Q: What particularly about the process of reporting using the UNGP Reporting Framework helped increase this buy-in, and understanding of human rights risks, of your colleagues? A: Our key piece of advice here is about talking with your colleagues. To get the information we needed for our report, we had to interview colleagues from numerous departments. We thought at first we’d struggle to get people to even accept the invitation to the interview. But that wasn’t the case. Of course we had the formal commitment in the first place: to report using the Reporting Framework. That helped ensure people were on board. Otherwise people ask, “Who agreed to do this? Who is responsible for this?”. We also had a chief supporter on the managing board and that was really helpful to us. Also, interviewees started referring us to yet more colleagues, when they realized that the discussion was worth their time. We also learned something interesting through these interviews about how to have a successful conversation with colleagues on human rights. Initially, we thought of these interviews as a gap analysis and as a result perhaps framed our questions somewhat negatively. But later we realized it was better to kick off the interview by asking colleagues “what are you proud of?”. We still got the information we needed, but people were more positive about engaging with us on human rights issues. Overall these interviews proved to be very helpful in both gathering information and building colleagues’ interest in the topic. Many of those interviews got colleagues thinking more deeply about how they should take responsibility for human rights in their daily work. Even when we interviewed people who weren’t so enthusiastic, we tried to find out why they weren’t so engaged – and that all contributed to our own learning to improve our efforts. Q: Many other Dutch banks will in the future be reporting using the UNGP Reporting Framework, due to the banking sector agreement signed last year. What do you think is unique about reporting on human rights for a bank? A: Since the Reporting Framework is focused on salient human rights issues, we initially thought we needed to structure the report around our salient issues. But the way we implement our commitment on labour rights for our own employees is very different from our processes to determine whether our clients manage labour issues in their supply chains. The real distinguishing factor, we felt, was the various roles we play as a bank – service provider, employer, lender and investment services provider – and understanding our connection to potential impacts on people. When we understand our role in the risk we can use our leverage to try to make positive change. So that’s how we structured our report: around the various roles we play, and our salient human rights issues per role. That was a better fit for our internal stakeholders and hopefully for external readers made sense. The other aspect we really noticed was that we have a lot of broad ‘sustainability’ or ‘ESE/ESG’ processes, in which the human rights component is not clearly spelled out. So we had to dissect these broader efforts, for example by looking for human rights aspects in Sustainalytics criteria we already use for all investments. Ajinomoto is currently using the UNGP Reporting Framework for internal management. It initially translated the Reporting Framework into Japanese for its internal use, and has since made the translation publicly available. Q: Why did Ajinomoto decide to use the UNGP Reporting Framework to support the company’s management of human rights issues? A: Since the United Nations adopted the Guiding Principles on Business and Human Rights (UNGPs), there have been increasing calls from society for businesses to fulfil its responsibility to respect human rights. A growing number of governments, civil society organizations, ESG rating agencies and investors are demanding the disclosure of corporate human rights performance and asking for answers to questions about companies’ records, as well as supporting evidence. These calls are underpinned by the UNGPs, which are becoming established as an authoritative international standard on business and human rights. We believe that the UNGP Reporting Framework is the ideal tool for understanding the Guiding Principles and facilitating the disclosure of human rights information. Using the Framework as a guide, we are making further efforts while having external and internal dialogue on human rights. Interest in corporate human rights initiatives – including those across supply chains – is growing in Japan. With the Tokyo 2020 Olympic and Paralympic Games approaching, this activity must be accelerated. Accordingly, we are publishing a Japanese translation of this Framework for businesses in Japan and hope that it will promote further understanding of human rights issues and aid corporate efforts to tackle them. Ericsson has issued three years of reporting using the Reporting Framework. Ericsson’s disclosure is also available in the UNGP Reporting Database. Q: Why did Ericsson decide to be an early adopter of the Reporting Framework? A: At Ericsson, we have been reporting on human rights issues for many years. The Reporting Framework gives us a systematic approach to reporting on human rights that ensures we are putting out the most relevant information. The Framework helps Ericsson focus on salient human rights issues. When we are focused, it’s easier to get buy-in within the company, because colleagues understand the importance and impact more clearly. Q: What has been your experience as the human rights champion within the company working across different departments to report using the Reporting Framework? How have you gotten buy-in for the process? A: We have a robust system for reporting, whereby people from different functions responsible for working with different issues are part of the reporting process from the beginning. These Subject Matter Experts themselves propose what should be part of the reporting. We also know that the Reporting Framework is not only about reporting but also about the day-to-day work. In order to be able to report on human rights issues, you also need to have something solid to report about. This means there is a need for a clear implementation of the UNGPs within the management system and here the Reporting Framework is a useful tool to help manage human rights risks. Q: Ericsson is the only early adopter company to now have used the Framework two years in a row. What can you share with us about that experience? A: We strived the second time around to include more information, in a more structured way, to focus more on the salient human rights issues. It is challenging to determine what continuous improvement looks like in reporting. It’s not just about more information – it’s about the quality of the information, which of course goes back to what we’re doing on human rights as a day-to-day part of our business. And of course we are constantly working on improving that. H&M issued its first report using the UNGP Reporting Framework in April 2016. H&M’s disclosure is also included in the UNGP Reporting Database. Q: Why did H&M choose to be an early adopter? A: Since the UN Guiding Principles on Business and Human Rights (UNGPs) were endorsed by the UN in 2011, we have been very focused on implementing them. In 2012 we adopted our human rights policy and created a human rights strategy and vision. We worked continuously to integrate our human rights approach better and further across our business and value chain. A few years ago we participated in consultations on the UNGP Reporting Framework, and already at that time we thought the Framework was interesting. It provided an adequate way – a way aligned to the UNGPs – to report on our human rights work. The Reporting Framework felt like a good opportunity for us to benchmark ourselves on how well we are implementing the UNGPs. The Reporting Framework is a chance for us to see if we are ‘walking the talk’ – actually living up to our commitments on human rights. Q: What have you learned from the process of using the Reporting Framework? A: The entire process of defining our salient human rights issues was a learning process for us. We have done a materiality analysis for a few years now, and we review it regularly. But the materiality analysis is not very specific to human rights issues. The exercise of determining our salient human rights issues has been a great experience for us. It’s a real help to sit down internally and also with external stakeholders to discuss how we look at our actual and potential impacts on people in the value chain, and pinpoint areas we should focus on. We confirmed that some salient issues we have been working on we should continue to work on. We also realized that some salient issues, which were already to some extent addressed in our programmes on human rights, need more attention. The real added value of using the Framework has been reporting in a very straightforward manner our salient issues, stating how we define them, and stating where in the value chain we think they are at most risk. In previous reports we have talked about challenges, but with the Reporting Framework we can give a really clear message: Here are the issues we will focus on from a human rights perspective, and they will shape our work going forward. The UNGPs tell us we should ‘know and show’ that we respect human rights in practice. To be able to show, you have to know. To be able to know, you have to do. The Reporting Framework uncovers the places where you need to focus and improve, so that it becomes very clear what you need to do. It’s a very structured way to approach practicing respect for human rights. Q: What are some of the key challenges you faced in using the Reporting Framework? A: I would go back again to the salient issues. For some of them, the ones we have been addressing for some time now, we have so much information: case examples, long term goals, data and information that is easy accessible. We could do a full report on certain issues and how we are addressing them, like fair living wages or monitoring and capacity building of tier 1 suppliers. But for some issues we identified as salient, we don’t have that much information and we do not yet have holistic strategies in place. So now we’re taking our globally identified salient issues and looking at them from a local perspective, so we can see which ones should be the highest priorities in one market compared to another. This helps us work quite practically on the ground to address issues and drive positive change. Nestlé issued its first report using the Reporting Framework in April 2016. Nestlé’s disclosure is also included in the UNGP Reporting Database. Q: Why did Nestlé choose to become an early adopter of the Reporting Framework? A: For a very simple reason. We’ve had our human rights due diligence programme in place since 2011. While the programme has been developed based on the UN Guiding Principles, we had never checked if our work was actually fully aligned to the UNGPs — because there wasn’t a tool out there to help us check. Other reporting frameworks were too focused on quantitative measures that didn’t necessarily match key indicators for us, and they weren’t squarely based on the Guiding Principles. The Reporting Framework was a good opportunity to check how well or poorly we were implementing the Guiding Principles — what we had achieved, and where the gaps are. So we used the Reporting Framework not only as a reporting tool, but also as a management tool, to help us identify and close gaps. Q: Were you concerned that reporting using the Reporting Framework would reveal too many gaps? That your report wouldn’t ‘look good’? A: We’ve been working on human rights issues for many years. Based on this experience, we know it’s impossible to be perfect in this area — companies will always face human rights risks because they are partly linked to human behaviour, the socio-economic conditions or lack of governance in the countries where they operate, and other factors that are beyond their control. We’re not looking for perfection here but for continuous improvement. Therefore, reporting on gaps is something we see as positive and an opportunity to engage our stakeholders on what needs to be done to address these gaps, and how they can contribute. Q: What were some of the highlights and key challenges of your experience using the Reporting Framework? A: The process of identifying salient issues was very important for us. It was a combination of internal and external consultations. Internally it has helped us align with what we need to focus on. Also, when you interact with top management and you try to say what human rights are, it’s a bit unclear to them because it covers so many issues. The fact that we’ve been able to identify those issues that are most salient for us as a company helped facilitate the interaction with top management and explain to them what is salient and why. For our external consultations, we shared the draft list of salient issues with key stakeholders last year. Great inputs came out of this consultation process. The fact that we’ve been able to identify our salient issues and there is strong alignment externally and internally or what those issues are is a good step forward. It will help make our work on human rights even more practical by focusing resources and time on these salient issues, and link salient issues to our top-level corporate commitments. The main challenge is to make sure that get this implemented on the ground, in countries where we source raw materials, operate our factories and distribute our products – this is what success means to us. Newmont issued its first report using the Reporting Framework in April 2016. Q: Why did Newmont choose to be an early adopter of the Reporting Framework? A: It was a natural progression. Over the last three years we have been working to strengthen Newmont’s approach to managing human rights. We refreshed our code of conduct and we updated our policy, both of which specifically address our commitment to respect human rights and to implement systems for human rights due diligence and risk management. This set our direction from a policy perspective. The next step was to create and implement a human rights performance standard. As we worked to implement that standard, we understood that there was a business need for reporting on our human rights performance, at the site, regional and corporate levels, as well as externally. We saw the Reporting Framework as a tool we could use to fully implement our human rights programme. We also recognized that being an early adopter presented an opportunity to be a leader in our industry and learn from the experiences of other adopters. Q: What are some of your key takeaways from the process of using the Reporting Framework? A: We went through the initial process of identifying our salient human rights issues from the corporate level with a view across our business. We created a cross-functional working group on human rights during development and implementation of the performance standard as it was a really important way to gain buy-in and accountability across our company for a consistent approach to managing human rights. The working group participated in the initial workshop to identify Newmont’s salient human rights risks, where Shift helped us walk through the process of identifying our business activities and how they might link to potential impacts on individuals’ human rights. Bringing the cross-functional group through that process — something none of us had done before — really helped shift mindsets and think differently about how our business can impact people. Another way the Reporting Framework has been helpful is that it gives us a way to communicate about human rights. It provided a space internally to discuss human rights related to business processes and with business functions we had not previously engaged regarding the management of human rights. It also gave us a consistent vocabulary that we didn’t have before. This allowed us to communicate more effectively together and to focus on the central issue of salience and risk to people. Q: What next? Is there something that you’re now doing, or thinking about doing, as a result of using the Reporting Framework? The Reporting Framework reinforces our efforts to consistently stay aware of and discuss our human rights risks. Going forward, we want to ensure that we have ongoing processes in place to identify our salient human rights issues at the site level. Newmont operations currently utilize complaint and grievance mechanisms and extensive stakeholder engagement activities to inform our business risk assessments and we want to use those same tools to help us identify risks to the company through the lens of respecting human rights. Additionally, we realized a need for further defining our approach to manage human rights risks related to our supply chain. Newmont will be developing a supplier code of conduct and a pre-qualification process inclusive of human rights considerations that will give us much improved visibility into our supply chain and continue to improve our overall performance. Novo Nordisk initially used the Reporting Framework for internal management, and in February 2017 they issued a public report using the Framework. We interviewed them both before and after they publicly reporting using the UNGP Reporting Framework. Q: Novo Nordisk has been using the Reporting Framework for internal management. How did you realize the Framework could be useful for internal management? A: For us, reporting has to reflect how we manage our business. So we always begin there. I could immediately see the Reporting Framework as a very useful management tool. The questions that are in the Framework made total sense to me. Since 2011 we have been implementing the UN Guiding Principles on Business and Human Rights step by step. In 2014 we initiated comprehensive human rights due diligence processes and mapping of operational-level grievance mechanisms. We had started with an assessment of our value chain processes and initiated several workstreams. I had been asking the same questions as the Framework’s Part C questions. But back then we didn’t have the Framework! So when I saw it in 2015, it totally resonated with me. If you look at only the overarching questions of the Framework, they lay out the high level actions we need to take as a company to respect human rights — it’s very straightforward. The supporting questions are very helpful because they help us dig further. So when I looked at the Reporting Framework I thought, “I can translate this into my company, and we can make most out of it”. Q: How did the Reporting Framework accelerate your process to implement the UN Guiding Principles? What specifically are you using it for in internal management? A: The Reporting Framework helped take us to the next level on our human rights management. To select our salient issues, we introduced to internal stakeholders the core concepts of respect for human rights. We did 10 months of consultative processes to evaluate the severity of each of our potential human rights impacts and identified and prioritized them to select our salient issues – which have become our focus areas for action and tracking. All relevant value chain owners and business process owners were engaged. We also sought experts’ inputs. But we had to think for ourselves as we tried to select our salient issues. What does risk to people mean? What does it mean for a potential impact to be severe? How severe could our impact be if it occurs — however unlikely it is to occur? In assessing severity, why do we prioritize severity over likelihood? How are impacts on human dignity remediable? There was a lot of dialogue and reflection amongst our stakeholders. I believe this has helped us internalize respect for human rights and developed awareness and capacities. Q: After about a year of using the Reporting Framework as a management tool, you’ve now publicly reported using the Framework. What do you think was particularly helpful to you to be able to move from internal management to external reporting using the Framework? A: Reporting – communication — is just one key milestone in our due diligence processes. We focus on implementing the UNGPs and approached the Reporting Framework as a tool to further strengthen existing management systems, and as a framework for internal cross-functional discussions. We did that for over a year and it was a very useful process. By the time we needed to decide if we would like to publicly report using the Framework, it felt quite natural for our internal stakeholders in the company to go ahead. We are aware of what we are doing and we felt comfortable to show that to the public. My advice to other companies is to go a step at a time. It takes time and good dialogue to introduce new concepts into a company, first focusing on ‘knowing’ before ‘showing’.